Random Thoughts: How did it get to be the 1st of December already? How did it get to be the 1st of December already? I seriously thought I was back in the blogging mood when I got on the subject of light. I see now the last time I actually posted something - as opposed to thinking about posting something - was Nov. 13th. So here I sit at the end of the first day in December, look at how packed full the days ahead are and wonder where blogging kind of writing will occur. It's clear that my writing muse packed her bags for an extended vacation on a tropical island. I think she is taking long strolls on deserted beaches, swimming in crystal blue seas, sleeping with her windows open, the better to hear the waves as they lap against the shore. She's probably drinking rum drinks with little umbrellas, learning how to sway her hips to the beat of native drums, wearing flowers in her hair, and bright colored muu muus. I hope she comes back rested and full of stories. In the mean time I'm sewing bears. I love how sometimes the things I do just feel right. That's the way I feel about making bears for people who have lost someone close to them, from the loved one's clothes. When I first started sewing these bears for my friend Diane, my only goal was to do something to help ease her pain. I had no idea that the bears would also help ease mine. Even though I don't know the people I've memorialized in t-shirts, dress shirts, clerical shirts, sweat shirts, work pants, woolen snow suits, and an old quilt, I've somehow discovered a sense of who they were. I don't think a person's spirit resides in their clothes. But I do think that because the clothes that are given to me are obviously special to the one(s) left behind, I feel the love that remains there. I like hearing the stories of the people the bears represent. In a strange way, I feel like I get to know them. Each bear is a recycled memory for others and creative piece of art for me. I call it "soul work." I feel honored to be given the opportunity to use my handiwork as a way to make someone who is grieving smile for awhile. Yes, tears are always a part of the process, but that just comes with the territory. 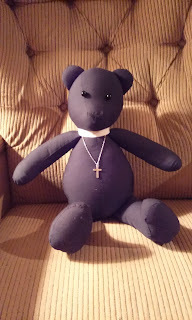 As I put the finishing touches on each bear, (s)he becomes my favorite. The one I completed tonight is in honor of Rev. Johnson H. Pace. A priest and friend for many years. Back in the days when I was working hard in the church, he gave me an honorary degree. DD. Devoted daughter, rather than Doctor of Divinity. Fr. Jack could recite a person's lineage back to the Mayflower, knew the scientific names for all kinds of plants and trees, never failed to remember birthdays, enjoyed working in God's gardens, even if it meant pulling weeds in the hot Florida sun, and called my father the Commodore. He was small in stature but big in heart. A tad eccentric, but really, who isn't? Thanksgiving came and went and I failed to write all the things I'm grateful for. Doesn't mean I'm not grateful. If you've followed my blog and still come back to check on whether I've written anything or not, I thank you. As the holidays approach, I hope you'll slow down, rather than rush from place to place. I hope you'll say God bless you, instead of Bah Humbug. I hope you'll share simple kindnesses with those you love and strangers alike - don't forget to be kind to yourself. I hope you'll put some tiny marshmallows in a cup of hot chocolate, and read a favorite Christmas story. I hope the light in your heart will sparkle as bright as lights on your tree. I hope there peace will surround you. Aah, Sweet Mary...God Bless You! You are a Weaver of Love!